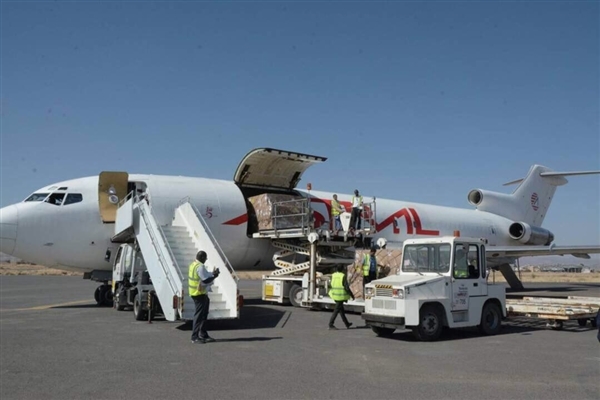 Four planes carrying relief aid arrived in Sana'a International Airport on Saturday, an official airport source said. "Four planes belonging to the UNICEF and the ICRC arrived in Sana'a Airport carrying aid cargo," said the source. This comes after the Arab Coalition backing the Yemeni government against the Houthi-Saleh rebels lifted its brief blockade on the airport. The Coalition had issued 42 permits to relief planes and vessels to arrive in Yemen. The Coalition has renewed its call to the United Nations to assume running Hodeidah Seaport which the militias use to smuggle Iranian arms to destabilize the security of Yemen and its neighboring countries. The Houthi-Saleh militias have been laying a siege around Yemen's biggest and most populated city of Taiz for three years and from the siege belt shelling the city with Katyuch rockets killing civilians every couple of days.